“Fame” in the Pierson High School auditorium on Friday. “Fame – The Musical,” the age-old story of a group of struggling, young performing artists in New York’s Fiorello H. LaGuardia High School, the city’s high school for the performing arts, is coming to Sag Harbor with a junior version of the production debuting this Thursday, November 13 performed by the Pierson Middle School Theatre Department. Set in 1980, the show takes theatregoers through the arduous audition process through graduation and the occasionally ill-conceived decisions made by the young performers as they struggle to find themselves as artists, and as people. This multi-talented cast will sing and dance their way to your hearts and leave you humming old favorites and new tunes as well guaranteed to stay with you as long as their dreams do. 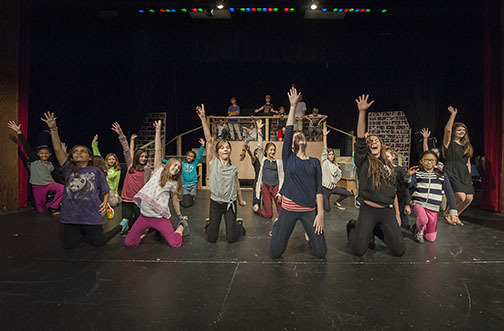 “Fame—The Musical” will debut on Thursday, November 13 at 7 p.m. in the Pierson Middle-High School auditorium with additional evening performances on Friday, November 14 and Saturday, November 15 at 7 p.m. A Sunday matinee will be performed on November 16 at 2 p.m. Reserved seating is available through Pierson’s main office by email at agalanty@sagharborschools.org. Admission is $7 per person.